Cataract is a clouding of the eye’s normally clear lens that affects vision. The widespread myth about a film layer covering the eye is not true. Cataracts that are in early or moderate stages are not visible to others. If the lens of the eye is completely clouded, the pupil will appear white or gray instead of the usual black. Patients will feel their vision worsening, especially when the sun is bright. In many cases, persons who have used reading glasses for years will suddenly notice that they can read without their spectacles – this is because eyes become myopic. As cataract progresses, the patient’s vision gradually worsens and in the end the eye will only react to light. Unfortunately, it is not yet possible to cure cataract with medications – the only treatment in this case is surgery. Nowadays it is not considered reasonable to postpone the surgery until the vision is completely lost. You should start thinking about having the surgery when the vision loss begins to affect your normal lifestyle: walking in the street, driving a car, reading, working, etc. If you are satisfied with your vision, there is no need to hurry up with the surgery. However, you should take into consideration the fact that your vision will become blurrier in time. You should also consider the wait involved in having the surgery. 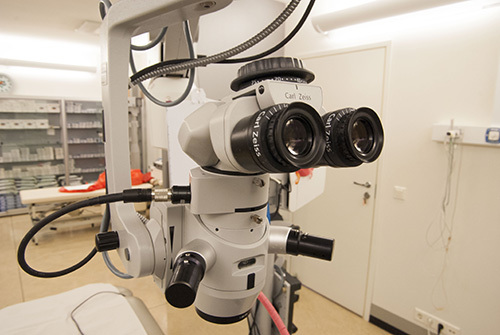 If you experience some vision loss after age 40, it is advisable to come to a consultation. This way we can find the most suitable solution for you. The operation will be performed according to the contemporary method of phacoemulsification. The use of lasers during lens replacement surgeries has not justified itself so far. The clouded lens of the eye will be broken up with an ultrasound-based technology through a very small incision. The incision is usually made into the outer corner of the eye. This incision is also used to insert the new lens. The artificial lens will be fixed inside the lens capsule which will hold it steady so that physical work and bending down will not affect the lens. This is an excellent solution for athletes. The incision is self-healing and no stitches are usually needed. We only use local anaesthesia that does not affect the general condition of the patient’s organism. Patients tend to be more affected by the preoperational anxiety. If you are on any blood pressure or heart medication, it would be advisable to continue taking them regularly prior to the operation. If your have a poor general health, i.e. you are suffering from colds, high blood pressure, hyperglycaemia, etc., you should try to improve your health condition before having surgery. Most chronic diseases that older people are suffering from and old age itself do not contraindicate surgery. The procedure is painless. The only thing a patient might feel is uncomfortable sensation of pressure in the eye. After surgery, the eye will not be covered with a bandage. We use an anaesthetic called Lidocain which is inserted into the eye in the form of a special gel (no injections!). Hypersensitivity to this medication is extremely rare. If you do happen to know that you are allergic to this medication, make sure to inform your doctor before the procedure. With contemporary methods of surgery dangerous complications occur very rarely (once or twice in 10,000 cases), although they are still something you have to take into consideration. During surgery haemorrhaging can occur in the eye, and after surgery the eye may develop inflammation or you may experience fluctuation of eye pressure. WILL THE CATARACT GROW BACK AFTER THE SURGERY? No, it won’t. The artificial lens is made of a durable material and it will stay in the eye, unaltered, for several decades. During the procedure, the artificial lens will be fixed inside the patient’s own lens capsule which can become clouded within a few years after the operation (in rare cases sooner). This condition can be successfully treated with YAG laser procedure, for which you must make an appointment. The clouding of the lens capsule will not recur. The cost of the procedure is calculated in accordance with the Estonian Health Insurance Fund’s price list, and there are no additional fees. If you intend to pay for the surgery yourself, you are free to choose the time of the surgery. The Health Insurance Fund will compensate for your surgery costs only in the case if you are on the waiting list for surgery in Nõmme Eye Centre. For more information call: +372 656 7677. Experience the world in crystal clear vision – make an appointment today!